TSJ is an organization of the people, and the people make it work! Pulling Yourself Up by Your Bootstraps: The Myth of Reconstruction Frances Cox and Tiosha Cox George Leland School, 5th and 6th grade. This workshop will help teachers to explore ways in which to connect history (judicial and social) with the opportunities and possibilities available to African Americans after reconstruction. It will present an overview that teachers can use to help students make connections between the Reconstruction period and the Post Civil-Right period. Becoming better social justice educators using a teacher-guided critical inquiry group model Uplift Social Justice Inquiry Group. Our presentation will include a brief description of how we came to start a critical inquiry group and what we’ve gained from it, both in our own development and in furthering a social justice direction in our school. We believe that our experience can inspire other groups of teachers to engage in a similar process of study, analysis and critique of our practice—or to do like we did and adapt the idea to something that better fits their situation. Cycle of Social Justice Learning and Action, CYIC- Chicago Youth Initiating Change. Organizers of the annual Social Justice Student Expo, bring student activism, social justice curriculum, and teacher / student / community collaborations alive. Join us in learning about this year's Cycle of Social Justice Learning and Action with a brief student / teacher panel, question and answer period, and ways to bring your social justice education to higher levels. Rethinking Mathematics: Teaching Social Justice by the Numbers Bob Peterson La Escuela Fratney, Milwaukee, WI, 5th Grade. Veteran teacher Bob Peterson will share stories and lessons from his quarter of a century of teaching 5th grade in inner city Milwaukee Public Schools. Peterson, who co-edited with Rico Gutstein, Rethinking Mathematics: Teaching Social Justice by the Numbers, will explore the power and importance of connecting the teaching of mathematics with issues of social justice. The session will include sample lessons, sharing by participants, and discussion of dilemmas faced by teachers engaging in this kind of work. Creating a Gentrification Teachers Manual, Pilsen Alliance. We will facilitate an interactive workshop on creating a teachers manual about gentrification. We will be asking participants to share their curriculum expertise, best practices on engaging youth in social causes, ideas on layout, and related academic exercises. Post Forum Discussion Facilitated by members of TSJ. This will be an opportunity to further the Teacher as Activist conversation and think about how to turn our conversation into action. Why we should strengthen the critical links between teachers and local school councils. Jitu Brown (Koco), Brenda Perry (LSC member) Julie Woestehoff (PURE). This workshop will engage the audience in a discussion of the purpose of local school councils and how they can be an invaluable resource in addressing student needs. Panelists will share the struggle to strengthen LSCs and what a school system without meaningful parent and community input would look like. Teaching for Change: Putting the Movement Back into Civil Rights Teaching. Participants will compare the traditional vs. accurate narrative on the Civil Rights Movement and then consider ways to introduce the accurate, people’s history in elementary classrooms. Kelly and Senn High Schools. This workshop will be a discussion of ongoing projects against militarization in the schools with a focus on drawing out workshop participants and developing further strategy and networking with the goal of widening the campaign! Members of TSJ. For those interested in what the group has been and is doing, as well as becoming a part of what it does in the future, please join us for this introduction & conversation about Teachers for Social Justice. Connecting Our Activist and Teacher Selves. Liesl Buechler, Angy Folkes, Meredith Labadle, Ora Lewis-Clark, Cris Mann, Alina Slapac, & Rebecca Rogers Literacy for Social Justice Teacher Research Group, St. Louis. In this interactive workshop led by core members of the Literacy for Social Justice Teacher Research Group participants will explore the complexity of being an educator/activist. 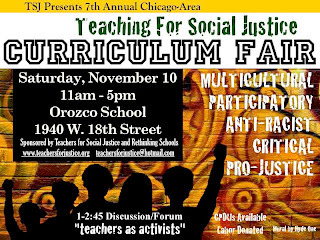 We will share our experiences working as educators/activists through the use of “story circles” – a cultural organizing tool useful for the community and the classroom. Together, we will share strategies and resources for working more effectively in our roles as educators/activists. Using a Thematic Approach to incorporate Social Justice in a Social Studies curriculum. North Lawndale College Prep Charter H.S. North Lawndale College Prep Charter H.S. has implemented a thematic approach to studying Social Studies. Core courses at NLCP include Origins for Freshman and Revolutions and Resistance (within the United States and globally) for Sophomores. The workshop will discuss the NCLP curriculum, the essential questions we try to address in each course and how elements can be applied to your work. On Saturday September 29 from 5-7:30 pm Teachers for Social Justice and Chicagotra will co-sponsor an event featuring the new documentary by Jill Friedberg, Un Poquito de Tanta Verdad. Jill will be with us to give the background, answer questions and guide a discussion of the film. Don't miss this great opportunity!! We are outraged by the events surrounding the arrest and detainment of 6 African American high school students in Jena, Louisiana. 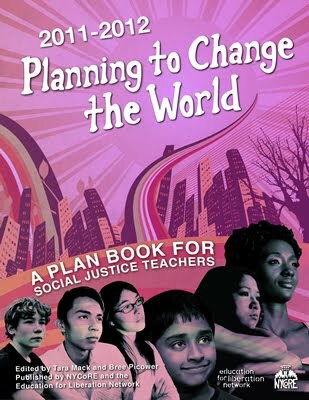 In conjunction with TAG, a growing network of teacher organizations with a focus on social justice education, we offer this curriculum resource guide to provide educators with tools to engage their students in discussions about why events like Jena 6 are still happening in the year 2007 and how people are acting to challenge them. "The vast majority of LSCs are viable governance organizations that responsibly carry out their mandated duties and are active in building school and community relationships." Across Chicago, LSC members must protect the LSC's right to select and renew principal contracts. Get help from other parents, community members, and educators to contact legislators. Call members of the House and Senate Education Committee and tell them: OPPOSE LAST MINUTE LEGISLATION TO CHANGE THE LSC'S ROLE IN CHOOSING PRINCIPALS IN CHICAGO! Remind them about the "arbitration process" they already put in place. And tell them how your LSC has worked hard with your school staff to improve student achievement. Email the Fact Sheet to others and urge them to contact their state legislators. The above link will take you to one of many versions of an "opt out" form. 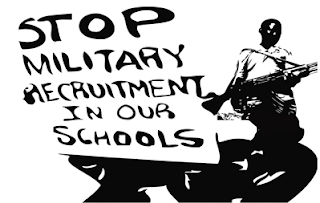 This form requests that the Board of Education remove the student's name from the list of students provided to military recruiters as dictated by the No Child Left Behind act. Please note: the student or the parent or guardian only need sign. The form does not require both parent and child sign. Student I.D. number is required or the form will not be processed! Suggestion for submitting the form Students can mail this directly to Donald Pittman as the form indicates. You can also collect them and mail them in bulk, perhaps ensuring a higher completion rate of the entire process. At Kelly High School, the Students for Social Justice Club has received permission to distribute these from a table during lunch time. The administration has asked that we provide them with a list of the names of signers so that they, too, can be sure to follow the students' wishes. Recruiting, at least at Kelly, is so frequent that almost all students will likely have a face-to-face encounter with a recruiter. Face-to-face is definitely a more effective recruiting method. However, the opt out campaign is a relatively low energy means to raise the recruiting issue and to identify students, faculty, and parents who might work on a more demanding campaign to limit recruiter access to our young people.